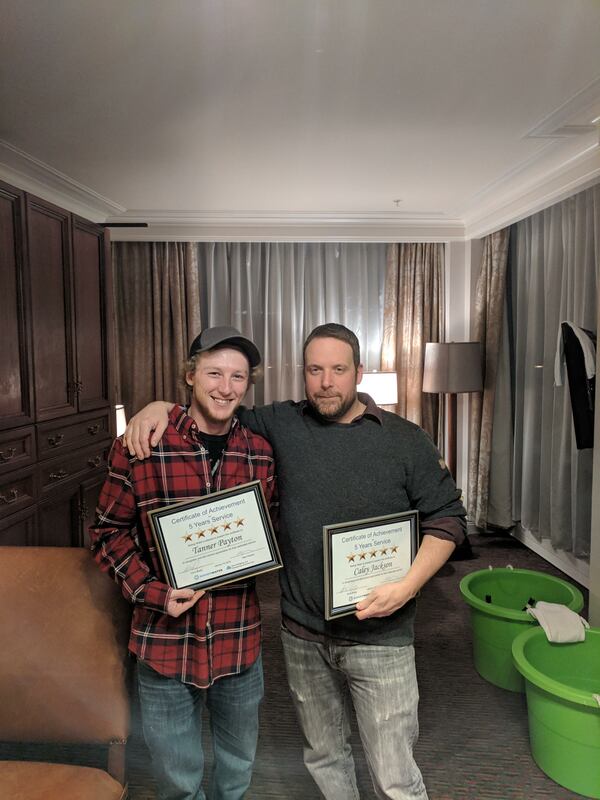 Congratulations to Caley Jackson and Tanner Payton, both of whom celebrated five years of service in December 2018 as team members for our key business partner Geo-dredging and Dewatering Solutions. Caley (right) is currently a Senior Technician and Field Supervisor that handles the planning and delivery of projects throughout Canada. During his career, Caley has been involved in many assignments ranging from simple lagoon cleanouts to challenging environmental projects to contain hazardous byproducts at mine sites. He says the unique aspects of each project motivate him to find solutions and apply that experience to bigger challenges in the future. Tanner (left) is an Onsite Field Technician and is continually fascinated by the diversity and impact of the work he does. He’s been involved in many projects throughout eastern Canada and is always excited by the new experience and knowledge that each project brings.